When you’re looking for a unique piece of jewelry to put all eyes on you, you’ll be glad you have the Shimmer and Shine Necklace pattern from I Like Crochet. Wear this sparkling necklace with its gleaming stone pendant, and you’ll be admired for your exquisite taste as well as your incredible crochet skills. You’ll create this statement piece with luxurious metallic yarn. Simple stitches form the delicate necklace and the wrap for the cabochon that hangs from it. The polished cabochon is the star, so choose a color you love. You could select a stone that mimics your birthstone, one that’s your favorite color, or simply a stone that makes you happy. It’s your choice! Work the Shimmer and Shine Necklace pattern in two pieces: the length and the pendant edging. You can adjust the length easily—just keep going until you reach the length you desire. When you’ve finished both pieces, simply glue the cabochon into the edged pendant, let dry, and then sew the pieces together. That’s it! Now you’re ready for a special night out. Award-winning crochet designer Jennifer Ryan created this pattern for I Like Crochet and you. 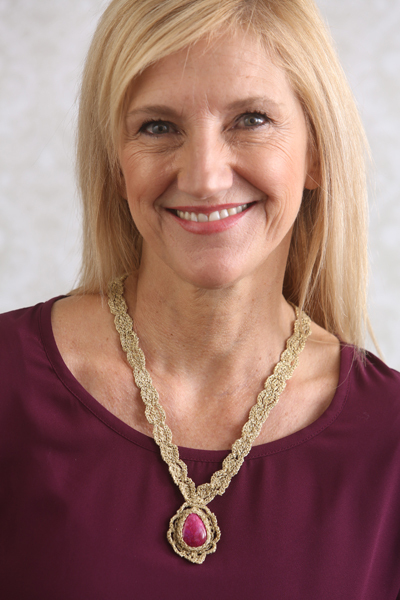 Celtic knot crochet is her specialty, and the lacy Shimmer and Shine Necklace pattern reflects Jennifer’s love of intricate handmade accessories, Now you can replicate her stunning artistry with this pattern! We show the Shimmer and Shine Necklace pattern worked in metallic gold yarn. But just imagine this lovely piece in metallic black, silver, or ivory. Choose the yarn that complements the stone, your complexion, or your favorite outfit. Or, make this crochet necklace for a lucky friend. However you make this crochet accessory pattern, it will be a one-of-a-kind expression of your artistry. Wear one—or give one—and shine! This pattern is included in the April 2016 issue of I Like Crochet. And wouldn’t you just love to access it anywhere you go? You can! If you become a Gold Club Member, you’ll be able to view this easy pattern on your laptop or tablet – whichever device you prefer! Of course when you become a Gold Club member, you’ll also get stitch tips and tutorials, and oh, yes … 600+ patterns for everything from spring shawls to cuddly baby blankets! And you can take all of it with you wherever you want to crochet – on the sofa, at the park, on a plane or train … well, you get the picture. If you’re a subscriber, be sure to check it out in the April 2016 issue of I Like Crochet And if not – why not subscribe now to get all of the goodies mentioned above?